Apple has more in its pipeline than just new Macs and iOS products; the company is aggressively planning out and building new data centers to support iCloud and related iTunes features. Here's a look at the next major construction project planned at the new Reno Technology Park. 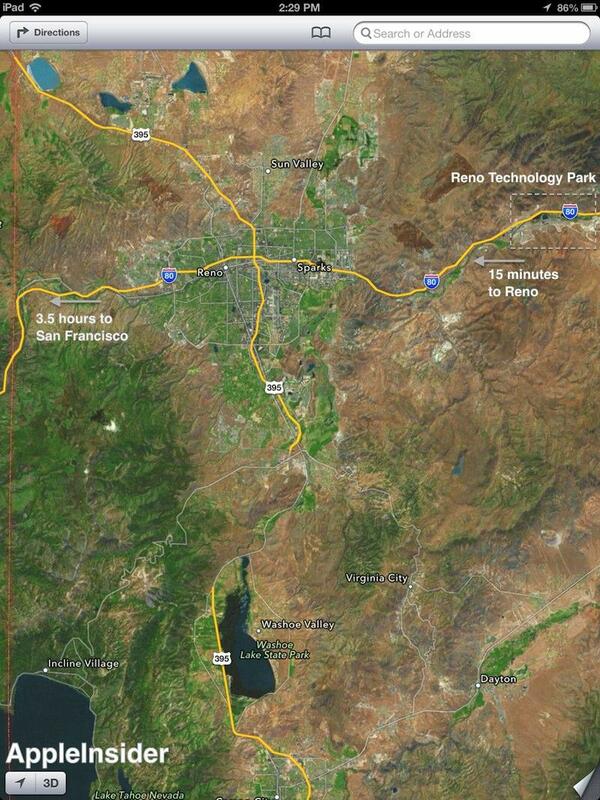 Seven years after locating its Braeburn Capital asset management subsidiary in Reno, Nevada (largely for tax purposes), Apple is planning an expansion of its footprint in the area for reasons beyond favorable tax rates. Among the top factors that attracted Apple's attention to Reno were access to low cost power with solar and other renewable options; availability of high speed fibre optic conduits; limited risk of natural or man made disasters; and lower overall costs combined with, of course, tax incentives. While Apple's Braeburn group was attracted by the state's lack of a corporate income tax, that factor is far less important to the location of Apple's data centers, which don't directly generate substantial revenues. Instead, low property and sales taxes were important. The State of Nevada, Washoe County and the City of Reno collectively approved a series of tax abatements for Apple last summer, paving the way for Apple to begin construction. The incentives run for more than a decade, and portions of the tax reductions can be extended through 2042. However, Reno isn't the only location in the US with low property and sales taxes, or economic conditions what will prompt state and local governments to offer tax incentives to attract the investment of a company like Apple. Nebraska, Oregon and Wyoming have already adopted tax mitigation legislation specifically to attract data centers. Texas and Utah both offer greater tax incentive packages than Nevada does. But taxes aren't the only thing data center builders like Apple evaluate in picking a site. A study that looked at a variety of competing data center construction and operational cost factors at a series of different potential sites performed by Nevada indicated that, even with tax incentives, Reno couldn't beat the overall cost advantages of a site in Oregon. Fortunately for Nevada, Apple wants to build multiple sites; the company is now building massive data centers in both Oregon and Nevada.